Coming out from under the shadow of a much lauded Donmar Warehouse production (with Derek Jacobi as the eponymous King) the Royal Shakespeare Company’s King Lear emerges victorious. David Farr’s exhilarating production celebrates Shakespeare both as lauded poet and enthralling entertainer of the populace. Farr’s company breathe new life into Lear evoking humanity in all its grotesque complexity. Within this tragedy comes a bubbling laughter that seeps up from an Elizabethan text and into the gurgling throats of a highly receptive 21st Century audience. Framing this contemporary take perfectly is Jon Bausor’s thundering set. An active player in each scene it fizzles, clanks and strains as chains and steel cables shudder, always threatening to envelope each soul brave enough to stand up on stage. Bausor’s design even indulges in a couple of guilty pleasures along the way; with a flickering chandelier hinting cheekily towards that lord of commercial theatre, Andrew Lloyd Webber. Farr keeps this healthy sense of showmanship ever present but in the midst of it all the story is told with breathtaking clarity. The whole cast is gloriously well honed, taking the kernel of truth at the heart of each line and nurturing it into something unexpected. Tunji Kasim may lack the gravitas for a true Machiavellian villain but his Edmund has the audience eating out of the palm of his hand. Movingly the moment of reconciliation between Charles Aitken’s spiritual Edgar and Geoffrey Freshwater’s honourable Gloucester gives us a poignant reminder that the young don’t always destroy the old. With Kathryn Hunter’s shock departure Sophie Russell more than steps up to bat, taking on Hunter’s intended role admirably. Her Fool is a bitter harlequin whose canary voiced wisdom shakes our King and his audience to their very core. Her glassy eyes see everything and there is a melancholy to each flick and twisted turn that envelopes her constantly shifting form. But last honours must go to Hicks. His Lear rails against an epic storm before even a drop of rain is felt and continues to do so long after it has dried as his age besets him. An often underrated Shakespearian actor, his understanding of each moment is iron cast. 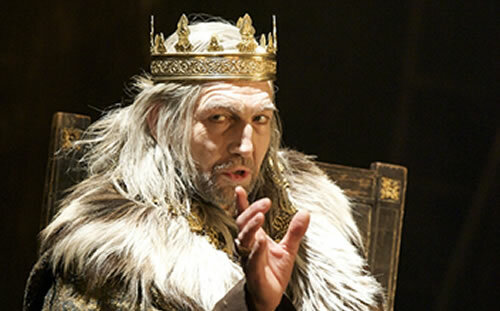 Hicks plays within this sinewy framework vividly, resulting in a truly unique performance at the heart of an original and invigorating King Lear.